On Friday 27 November it was 60 years since Rosa Parks refused to give up her bus seat for a white person in Birmingham Alabama. On Friday morning there was a fascinating piece on Woman’s Hour where Jenny Murray was interview Crystal Sanders from Penn State University from and asking why we hear more about Rosa’s role than other women in the Civil Rights Movement. Sanders gave a short bio of some of the other notable women working for the National Association of Coloured People (NACP). 9-16 November was Academic Book Week which celebrates the importance of academic books and also promotes their relevance and use to the public at large. This was the first time the event has run and it’s global. Gross, R. and Kinnison, N. (2014) Psychology for Nurses and Health Professionals. 2nd edn. New York: CRC Press. Wadeley, A. (2011) AQA AS Psychology: Unit 1 Cognitive Psychology, Developmental Psychology and Research Methods. London: Collins Education. Gold Mine by Kuznetsov is licensed under CC BY 2.0. First of all, what do we mean by information overload? It is that feeling of falling down a dark hole when there is too much information to carry out a task. So even simple tasks can be made difficult when we are faced with too many options and no specific direction. For example, you may need to find out about main theorists for a subject for your UCAS application. As Confucius is credited with saying ‘You can not open a book without learning something.’ There are entire libraries online and offline devoted to human knowledge. Where do you start? If you have access to lots of information this gives you the chance to be selective and find a direction. The trouble is how can you be selective without being biased or limited? How can you read it all? We all need help with overcoming our biases, speed reading and managing time. The key is not learning willy-nilly (although this can be great too sometimes!) but to focus on what you need to learn for the task at hand. Finding the most appropriate, relevant nuggets of information is the ultimate challenge of academic study (and who knows, probably in life too!). There is no one way to cope with information overload. We would like to hear about your advice to other students on that awful feeling of being overwhelmed with too many sources, too many theories, too many words. What do you do? What if you are dyslexic? What if you are starved for time? If you post a tip to us by email, on Twitter or in the LRC and you may receive a World Science Day calendar thanks to UNESCO. ‘Internet es aburrido‘ by Daniel Lobo is licensed under CC-BY-2.0. Ebooks, ejournals, eresources…what is this ‘e’ all about? You may know ‘e’ stands for electronic. 99% of the time that means something available on the internet. But as I hope I can convince you, e also means extra. Getting your hands on the pages of a book is not the be all and end all of learning. For example, books often have recommended web links to access more information online. As they are coming from expert authors these extra resources are bound to be quite good. You can view the Oxford University Press’ YouTube playlists to find inspiring topics and academics in many fields such as psychology, science and history. They also feature authors of their Very Short Introduction series to get you hooked on a new subject. Don’t worry about information overload they are usually only 5 minutes long and can satisfy your curiosity or send you in a new direction. Bear in mind they want you to read their book, but you don’t have to. The same goes with TED talks which are engaging summaries and snippets from academics and experts. They will often have written lots of information on their subjects but a TED talk will be a good overview and introduction. Also lots of advice for learning online. This one by Eli Pariser (2011) talks about online ‘filter bubbles’. So keep an eye out next time you open a book for extra resources you can access online. Tell us about your favourites. The internet is boring…*No it’s not. It’s 20 years since the Disability Discrimination Act (DDA) 1995 which gave those with disabilities citizenship rights. The act improved access at work and in society at large. Employers and public buildings like libraries made adjustments to their buildings, resources and equipment and services. These rights are now enshrined in the Equality Act 2010. There’s an exhibition at the People’s History Museum in Manchester marking how these rights have been won up to 19 November. Over the past two months we have been showing students how to use Read&Write 10 to read ebooks available on Dawsonera. We always recommend you use a free screen reader like Natural Reader when you are away from college. Using either of these helps you set the font colour, choose a background colour and get the reader to read the ebook out loud to you once you’ve downloaded the ebook. Otherwise you can use the toolbar to get it to read out loud as you view it online. There’s now a downloadable app for NaturalReader on the App Store and Google Play. Our ebrary ebooks also give you the opportunity to use coloured highlighter pens on the ebooks when you read them online. You can download these in the same way. Book by Dave Higgins is licensed under CC-BY-2.0. Pre-access to Higher Education students have been looking at sources this week. Do you know the difference between a peer-remewed…sorry peer-reviewed journal and and a professional journal? A peer-reviewed journal has a board of expert editors looking over the submitted articles before they are published. Here’s a great blog post explaining more about what to look out for to see whether it is a peer-reviewed article. They are found mainly at university level with professors and researchers who already know a lot about their subjects as the target audience. Here’s a website called OpenDOAR where you can search for university-level articles, many of which are peer-reviewed. However, rather than reading the whole thing you may just want to get an overview of the the research and conclusions by reading the abstract. On the other hand we have journals that are aimed at people working in the professions that they are writing for. We have a number in the LRC, such as ‘New Scientist’ and ‘New Statesman’. These have shorter articles and the language is often easier to understand than peer-reviewed journals. The editing process is not as strict so the information may not have as much authority as that of peer-reviewed articles. However, they are still excellent sources. Did we miss anything out? We hope you are enjoying the first stages of your project. 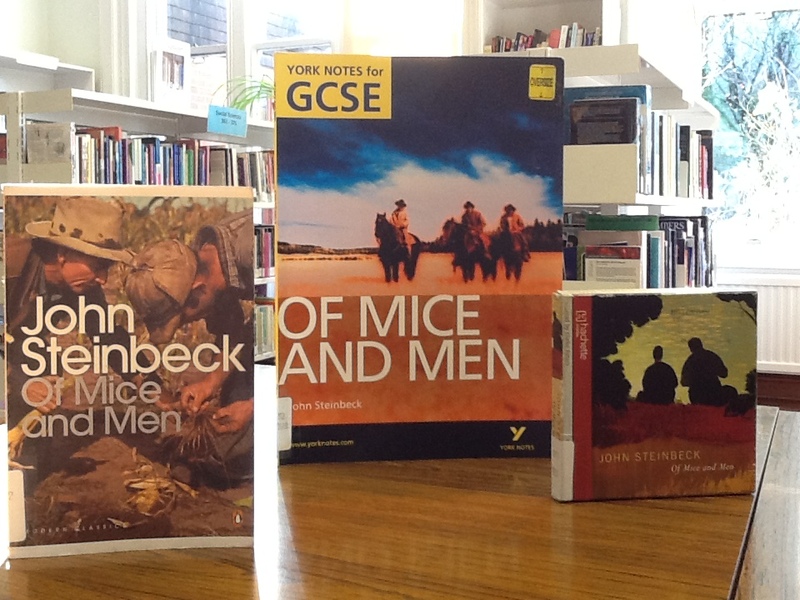 Our GCSE English students on Preaccess A and B are studying John Steinbeck’s Of Mice and Men. We’ve done some research on supporting material for students and found a recording of Steinbeck on YouTube discussing Of Mice and Men and Grapes of Wrath. For anyone doing an assignment for GCSE BBC Bitesize – Of Mice and Men has some handy links with character information, plot summary, themes and videos. Broadbent, D. (ed.) et al. (2011) GCSE English text guide – Of mice and men foundation. Newcastle-upon-Tyne: CGP Books. Steinbeck, J. and Peters, C. (2010) Of mice and men [CD-audio]. Little, Brown. Wnat to know more about Steinbeck’s characters from his novels? Take a look at the Library of Congress’s John Steinbeck Map of America on the American Treasures of the Library of Congress. The map by Molly Maguire has pictures of characters and numbers on the map to indicate which novel they appear in. If you’re into apps there’s a free download from the National Theatre with interviews with the cast James Franco and Chris O’Dowd and a Revise Of Mice and Men app on Appcrawlr.